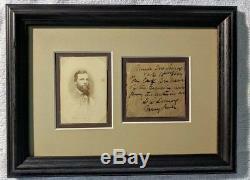 Civil War Confederate Major General Lunsford Lomax War-Date Photograph and Endorsement Signed. Offered today is an extremely rare Lomax photograph and endorsement from the war. Its nearly impossible to get your hands on any war-date images of Lomax, they just dont exist in any significant numbers. Not only is this unmounted salt print rare, the provenance of the photograph is fascinating. Here is the back story on the photograph. The photograph is attributed to Charles Richard Rees, a photographer of Confederate subjects in Richmond, Virginia. The original owner of the images was Confederate Major and Map Maker, Albert Henry Campbell! Here is some additional information on Major Campbell. Albert Henry Campbell (1826 1899) was born in Charleston, WV where he lived until he entered Brown University, Providence, RI in 1844. In Providence, he also met and married Mary Paine Stebbins in 1847. He studied civil engineering and was engaged in surveys for a number of railroads west. In 1857 he was appointed General Superintendent in charge of constructing wagon roads from Fort Kearny to the South Pass of the Rocky Mountains to the Eastern portion of California, and the road from Ft. Ridgely in Minnesota to South Pass. Campbell produced (among many other items) the wood engravings in the 32nd and 35th Parallel volumes (New Mexico and California) of the Pacific Railroad Reports. In his capacity as superintendent, he was supervisor to Frederick Lander when Lander mounted his expedition to capture the West in art. And while Campbell was an amateur artist in his own right, he did not accompany Lander on this expedition, but his brother, James, would go as a guide. When the Civil War erupted, Campbell cast his lot with the Confederacy. He secured an appointment as Lieutenant in the Corps of Engineers, and was later promoted to Captain, then Major. He eventually would head the Topographical Department of the Army of Northern Virginia, and spent many hours with General R.
Lee (who was himself a more than adequate topographer), becoming a personal friend of the General. He was with Lee the entire day during which he surrendered the ANV at Appomattox Court House, and broke the first twig from the legendary apple tree under which Lee rested before the signing of the surrender. All of this information is verifiable by going to Cowans Auctions and doing a past item search for Lunsford Lomax. The endorsement is completely in Lomaxs hand and is dated. Dated December 18th, 1864 and signed, L. This item has been professionally framed, to include double matting and museum quality plexiglass. The photograph and endorsement are secured using photo corners. The framed piece measures approximately 8 X 11.5 in size. Member of the Universal Autograph Collectors Club (UACC). All signatures are AUTHENTIC, no copies or reproductions. 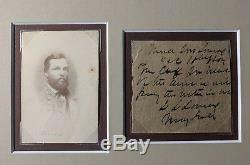 The item "Civil War Confederate General Lunsford Lomax War-Date Photograph and Endorsement" is in sale since Sunday, July 22, 2018. This item is in the category "Collectibles\Militaria\Civil War (1861-65)\Original Period Items\Documents". The seller is "ggmeade1863" and is located in Newport News, Virginia. This item can be shipped to United States.